Steiner 3-15x50 M5Xi Military (Horus H59 Reticle) Riflescope 8707-H59 is an excellent choice for attaining victory in the battlefield or competition. It is especially manufactured to cater to the requirements of military users across the world. 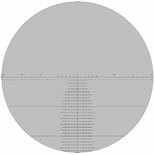 Highlighted by outstanding German engineering and optical systems, the scope features 3-15x magnification, 5x zoom factor, large 50mm objective, patented DuoScale elevation adjustment with second-rotation scale that is hidden when inactive, and etched-glass Horus H59 reticle on the first focal plane to widen the ability of shooters. Other attributes of the Steiner M5Xi 3-15x50 H59 consist of optimized tube and knob configuration, precise windage/ elevation adjustment, and broadband anti-reflection coatings for highest light transmission. In addition to that, the Steiner M5Xi 3-15x50, Steiner 8707-H59 in short, is built on a single piece 34mm tube, and has a waterproof, shockproof and fogproof exterior. It is ideal for snipers using the M110 platform, and competition shooters using precision bolt guns along with medium range shooting.